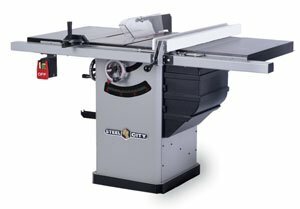 The Steel City 10" Cabinet Saw Model 35675 is the newest in the Steel City line of 10" cabinet saws. Provides easy and accurate settings for the 45° and 90° positive stops. Provides additional work support for a variety of sawing operations. Provides plenty of power for tough cutting operations. Provides more efficient dust collection than an open or partially enclosed stand unit. The precision-machined cast iron trunions are mounted to the cabinet to ensure perfect blade alignment, increased stability and to eliminate vibration. Includes 3 HP dual capacitor, single phase 230V, TEFC motor with Magnetic paddle-type switch; 30" Deluxe Fence System, carbide-tipped 40 tooth ATB saw blade, two 12" cast iron wings, 12" table board, standard blade insert, miter gauge, 4" dust connector, motor cover and user manual and parts list. Precision-Machined Table Top with 12" Wide Cast Iron Wings and Board provides additional work support for a variety of sawing operations. Easily removable for blade changing operations. Max. Depth of Cut at 90º 3 3/8"
Max. Depth of Cut at 45º 2 1/4"
Max. Rip Left of Blade 12 1/2"
Table in Front of Blade 12 1/2"
Table size 20" x 27"
Table Height from Floor 35 1/2"
Base Dimension for Mobile Base 22" x 19 1/2"
Weight (Shipping, Net) 455 lbs., 400 lbs. Do you have information or pictures to share about the Steel City 10" Cabinet Saw Model 35675? What do you think about it? Share your thoughts here.